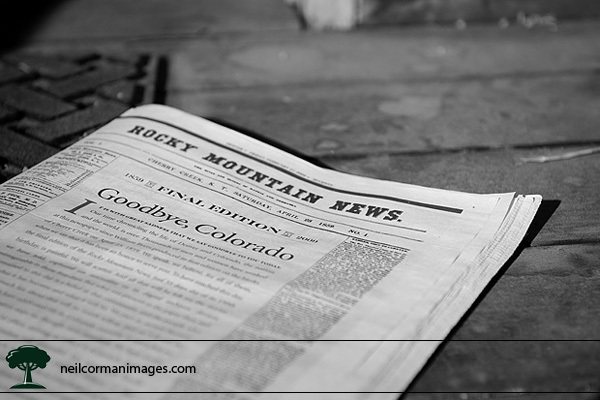 On February 27, 2009 the Rocky Mountain News published the final edition of the newspaper. Knowing it would be a memorable day in Colorado history as the paper had been in existence for almost 150 years, I woke up before dawn in the pursuit of some copies of the paper. I guess I was going a little overboard since the first location I stopped at to get the paper did not have their copies yet at 6am. I finally found a stack of the News at a nearby 7-11 and purchased a handful as well as an edition of the Denver Post, which was the main competitor to the News. While walking home I was thinking of how many people over the years had received the paper on the front door step of their home and that it could be an interesting photograph. The one problem was that the sun was just starting to rise and where my porch is located it needs to be about an hour after sunrise for the light to hit the porch at that time of the year. Once I was home I took a little nap, and woke up seeing the light was just about right at that time. Placing the paper on the porch with a slight toss I worked to get the image I was thinking of on the walk home. The front of the paper was quite unique for this final edition and I wanted to focus on the the memorable words “Goodbye, Colorado” gracing the cover. This meant using a shallow depth of field for the images I took that morning. While there is some color in the wood on the porch, I also changed the image to a pure black and white image as I felt this was appropriate for the story I was telling. I picked the one image which I felt told the story best, and this is one of the more popular images which I have sold in the past year. Camera settings: 1/3000 @ f/4, ISO 200.